← A wow experience from United Airlines. Wow. 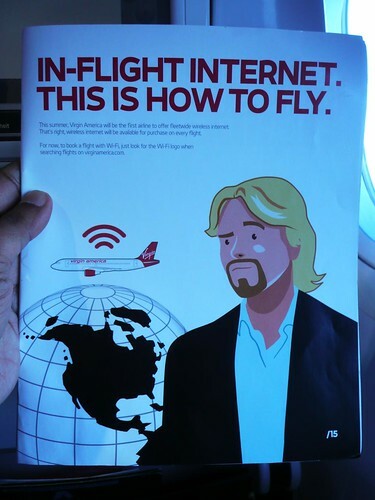 I tried inflight WiFi last week aboard Virgin America. The day I flew happened to be the same day Virgin became the first U.S. airline to offer Internet access across its entire fleet. I live tweeted and uploaded pictures to flickr inflight. Virgin uses GoGo, which is also available on select Delta, AirTran and American flights. United will be adding it on its p.s. flights between JFK and San Francisco/Los Angeles this summer. The system worked as advertised: easy to use and reasonably fast. Set up was similar to signing up for a paid hotspot on the ground; I entered my credit card and was online in a minute or so. It costs $9.95 for flights under 3 hours and $12.95 for longer flights. Speed was equivalent to a lower-tier U.S. home broadband connection. At 903 Kb/s down and 337 Kb/s up, it easily outperformed my 3G iPhone, both on speed and service availability. From a technology standpoint it’s great. But do I really want it? I’m really torn on that. I loved being able to chat with friends, check mail and update Twitter on my flight. The answer will really depend on what it does to the social contract we have with our fellow passengers and employers. On the employer front, what will expecations be for inflight WiFi? I’ve used my flight time to work on presentations, edit pictures, write blog posts (this post was written on a United non-WiFi flight), stare out the window and contemplate life. Having a big block of time without a lot of distractions can be very productive; some of my best product ideas have been formulated on a plane. Having the option to connect is great, but I don’t think I’d like being required to be online the whole time. This entry was posted in airlines, travel, twitter. Bookmark the permalink.